This summer Disney Springs is the place to be by day and by night! With a Grand Opening Summer Celebration taking place all season long, Disney Springs features an array of hard-to-pass-up deals and a variety of delectable new dining options at the newest neighborhood–Town Center, plus free nightly entertainment featuring more than 20 different acts performing across all four neighborhoods – The Marketplace, Westside, The Landing, and Town Center. To kick off the grand opening season, on July 15, the best of summer and Central Florida came together to celebrate Disney Springs-style – in Town Center, with an outdoor party under the stars where guests strolled into all sorts of discoveries designed to delight the senses — renowned chefs serving up scrumptious samples from their restaurants, performances by nationally recognized entertainers, and proprietors showcasing their products and store designs that make shopping at Disney Springs simply special. Wrapped in Florida-inspired, made-for-strolling promenades, arcing footbridges, flowing streams and waterfront charm, Disney Springs treats Walt Disney World Resort guests to an exciting blend of shopping, dining and entertainment with a Disney touch. By day or night guests can expect a vibrant scene at Disney Springs, whether they are shopping world-class brands, enjoying high-quality entertainment, having that special dining experience, pleasure boating on Village Lake or hopping a balloon skyward for spectacular views of Walt Disney World and beyond. Now and every day, guests can enjoy the benefits of a dramatically transformed exciting new waterfront district for world-class shopping, unique dining, and high-quality entertainment featuring more than 150 establishments across its four neighborhoods. Some of the most unique and recognizable names in retail such as UNIQLO, Vince Camuto, Anthropologie, Zara, Lilly Pulitzer, Columbia Sportswear, LACOSTE, Under Armour, kate spade new york, Sephora and Oakley all call Town Center home. Among new dining choices awaiting Town Center guests are restaurants developed by James Beard award-winning chefs. Frontera Cocina serves up gourmet Mexican cuisine and creative cocktails from the menu envisioned by celebrity chef Rick Bayless, a six-time James Beard Foundation winner. Chef Art Smith, two-time winner of the James Beard Award brings a unique taste of gourmet southern cuisine and Florida agriculture to the heart of Disney Springs with Homecoming Florida Kitchen and Southern Shine. High-quality retailers including Erwin Pearl for fashion jewelry and Havaianas for sandals are found along lantern-lined byways. Dine off a shipshape menu at The BOATHOUSE or enjoy, at Morimoto Asia, Pan-Asian cuisine from celebrity chef Matsaharu Morimoto, of Iron Chef fame. STK Orlando offers guests a fine dining experience set in chic, contemporary surroundings. Finish off the evening with a relaxing stroll to grab a signature gelato at Vivoli Gelateria or a crafted cocktail at Jock Lindsay’s Hangar Bar. Beautiful waterside shopping that combines new experiences such as an over-the-water pedestrian causeway, along with classic Disney favorites, including an expanded new Bibbity Bobbity Boutique inside the newly re-designed World of Disney store. From new acts at Cirque du Soleil to iconic restaurants to colorful food trucks to bowling with a stylized twist at Splitsville, West Side offers something for everyone. There is even the opportunity to lift off in a tethered balloon. Characters in Flight rises from the banks of Village Lake for eye-popping, 360-degree views (on a clear day you can see Florida’s east coast). Two new slot-smart parking decks where green lights indicate available spaces make parking convenient to the entire Disney Springs scene – and it’s free. Valet parking also is available. 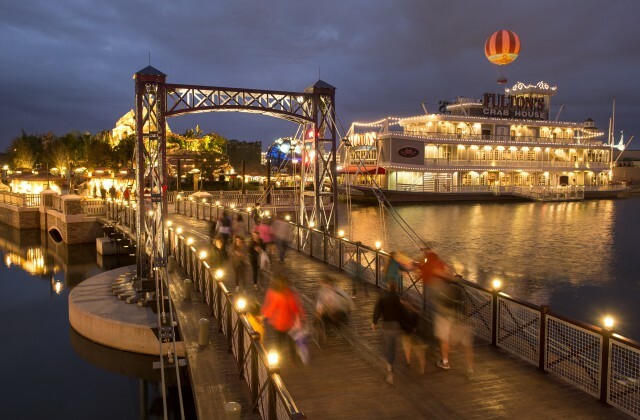 Disney Springs is easily accessed from I-4, Central Florida’s major interstate, and connected to the rest of Walt Disney World Resort by motor coach and watercraft.